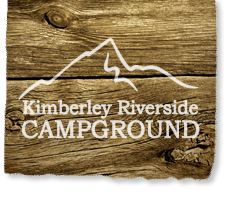 The Kimberley Riverside Campground is owned by the City of Kimberley and is fully operated by the Kimberley Community Development Society (KCDS) as a non-profit organization. 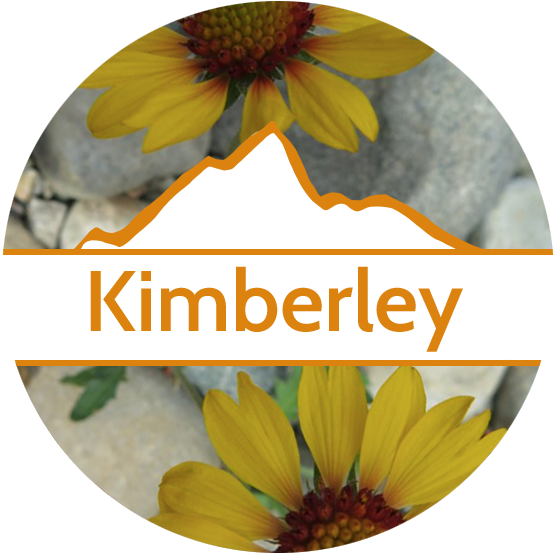 The Campground is located an 8 minute drive south west from Kimberley's town center (known as the Platzl). Our Campground is open with full services from early April through to late October and we accept bookings made 53 weeks (1 year + 1 week) in advance of your anticipated arrival date. Our office is open for reservations year round and we would be delighted to assist you anytime of the year. Please note during the winter months our office hours are limited. Take a quick walk with Google Street View around our campground. 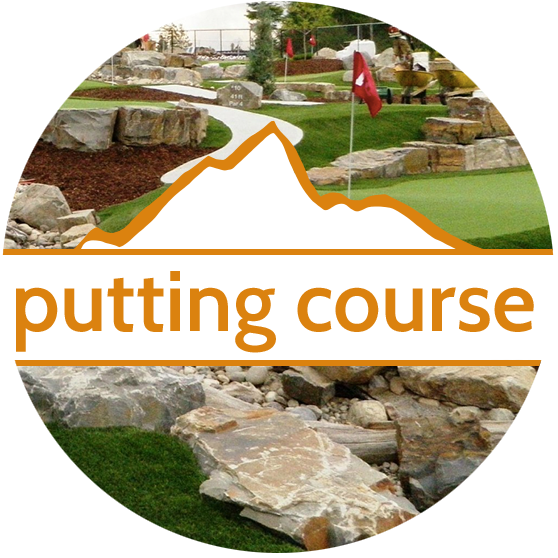 Our state of the art 18 hole putting course is open daily from Early May to Late September. Just over 23,000 sq ft in size, this course is like playing on a real golf course, only a miniature version. As you make your way through the course enjoy water ponds, streams and water falls, rock terraced fairways and greens, real sand traps, beautiful landscaping and more. The entire course is wheelchair accessible. Enjoy complimentary fiber optic internet at our 3 WiFi HotSpots! Our HotSpot locations are at the Mountain view washroom (by Site 33), at the Pine Meadows shower house (by site 119), or at our office and swimming pool area! Please note that these are HotSpots only and internet service away from the HotSpot is spotty at best. Each HotSpot has picnic tables provided for you to relax while surfing the web. 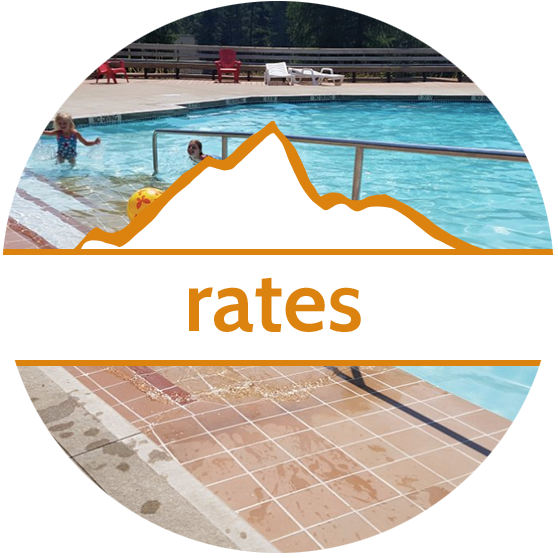 All registered campground guests are welcome to enjoy our FREE outdoor heated pool. Our swimming pool is child friendly with a gradual depth to the maximum of 4 feet. The pool consists of built in benches along the inside of the pool wall and a gently sloping entry ramp with hand railings. We also have a special wheelchair available for those with limited mobility use. The pool deck is furnished with lounge chairs and sunbeds, a timber frame pergola, our ping pong table and even a giant chess set! The huge poolside deck creates the perfect place to sit and relax in the sunshine. The resort pool is open from mid-June to mid-September, please inquire for exact dates. Take a walk down to the park and enjoy the many activities to choose from. The children's playground is equipped with giant swings, monkey bars, a slide and spring riders. Get your family and friends together for a game of bocce, horseshoes, basketball, or sand volleyball at the Sports Area. All equipment is available to borrow from the office. We have timber framed picnic shelter which is perfect for group gatherings and events. It is also the ideal place to seek shelter from the heat or those fair weather days. Please call our office to book the picnic shelter for your next family gathering. Over 4 kms of walking and hiking trails are spread throughout the campground. 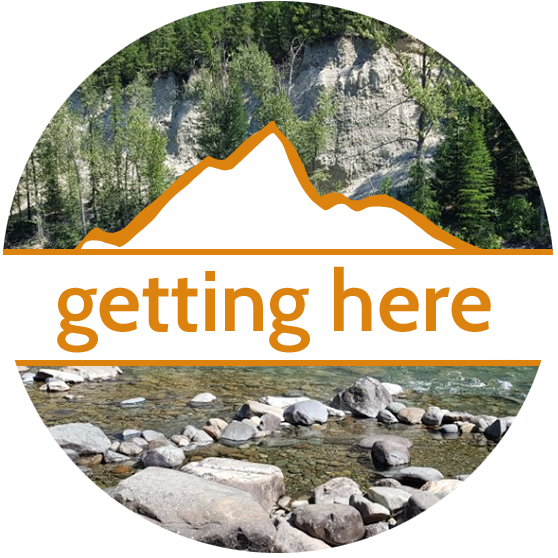 Bring your camera and check out the many scenic viewpoints as you stroll along the river, hike along the the high trails overlooking the Rocky Mountains to the east and the St. Mary River Valley to the west. Directly across the road from the campground lies the Kimberley Nature Park. The KNP is one of the largest municipal parks in Canada at 800 hectare (1800 acre) in size. Its varied terrain and diverse ecosystems provide endless opportunities for recreation and education. Join volunteers from the Kimberley Nature Park on a FREE guided hike, departing from the campground on Saturday mornings . Please inquire at the office for dates and sign-up information. One of the best campgrounds we have stayed at! It's clean, affordable, has excellent facilities, organized and was very enjoyable. Our commitment to the Environment is another great reason to stay at the Kimberley Riverside Campground. Our pool is mainly heated by Passive-Solar panels which use the sunshine to heat water through a series of tubes on located on our roof. Our office operates a paper free reservation system and goes to great lengths recycling and re-using paper. Our cleaning crews use natural and environmentally safe Green-Seal Certified cleaning products. Our toilet paper and paper towels are all made from recyclable materials and we have several recycling stations throughout the campground for paper, plastic, cardboard, glass and all types of drink containers. We have some of the most environmentally-friendly toilets on the market which utilize a low-volume/high pressure tank that uses half the water of a standard toilet. Additionally we use LED light bulbs and are in the process of switching our streetlights to LED to save on energy consumption! The Kimberley Riverside Campground is the ideal setting for family reunions and special group gatherings. Park facilities, picnic shelter and BBQ can be reserved for your group function. Peak Season functions are limited due to vehicle parking space, however most shoulder season bookings can be accommodated. Prices and Package information available from the office. This campsite has it all — fishing on the river, canoeing on the lake, access to town. This has been a remarkable trip for parents and children alike.